Do you want to get more booking? This ebook can help. Do you want to increase your birthday party shows? This PDF can show you the most effective ways available to get more birthday party shows without having to rely on building a website. Techniques you probably do not know about. This book will not only show you how to get more birthday party shows, but how to get more money from them. Using some of these techniques will increase your children's holiday shows. This ebook also reveals how to use a free source of advertising for maximum effectiveness. You will learn about a new source for shows that few magicians know about. This technique alone is worth the price of the book. Discover easy ways to expand your market in your area. If you are not doing these things, you are leaving money on the table. This book shows you a technique developed by Tommy Windsor that is a clever way to get your magic shows into trade shows and fairs. This method really works. How to make money doing shows for politicians, a little-known market that Devin has worked with great success and you can too. There is big money to be made from doing these shows. Learn how to become a motivational magician and about an agency who may book you. Learn the secrets behind magic seminars and how to conduct them. A lucrative market for the right magicians. 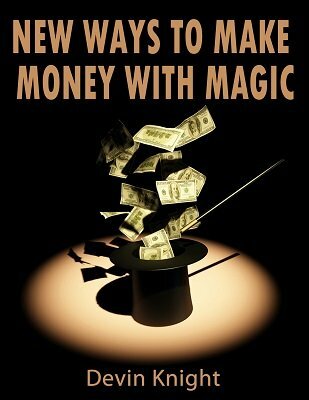 Teach magic classes to kids and increase your bottom line. Get the inside dope about guarantees and how they can increase your bookings. No pipe dreams in this ebook, but practical proven ideas used by such magicians as Donn Davison, Tommy Windsor and of course, Devin Knight. If you use just one idea in this ebook, it will pay for itself many times over. The book contains links and contact information you need to start implementing these ideas. No need to search, the places are included in the book. Stop being a follower and lead the magic field in your area. This book will show you how. NOTE: None of the techniques in this book involve Google, building websites or telephone book advertising. 1st edition 2015, 17 pages.